Pull In, Spin It, & Drive Off! 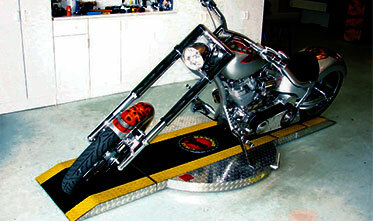 This unique motorcycle turntable system allows you to drive your motorcycle on, park it, spin it & drive off with ease. The black & yellow rubber compound material allows for easy drive on with oil & grease resistant non-skid surface which allows for easy clean up. 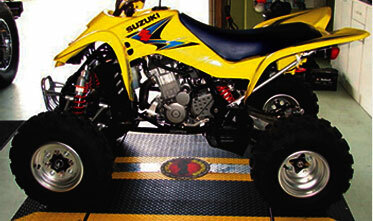 Never Back Your Bike Out Of Your Garage or Storage Area Again! Our unique, low profile ramping system allows you to drive on, spin your bike and drive off. 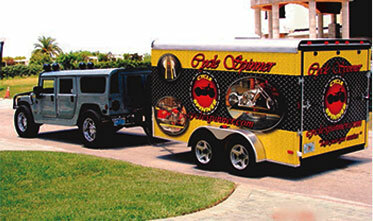 We also have ATV & Trike Spinners.